Nadya has been in the health and wellness business for years, teaching nutrition at the Institute of Holistic Nutrition. She understands how to live a healthy life and was practicing what she preaches but found that she was having trouble letting go of and managing her stress. Despite not having used cannabis in many years and feeling pressured by the negative stigma associated with cannabis, one day she tried a CBD oil and her life changed forever. Motivated by what she had discovered she set out to help spread the word about CBD. 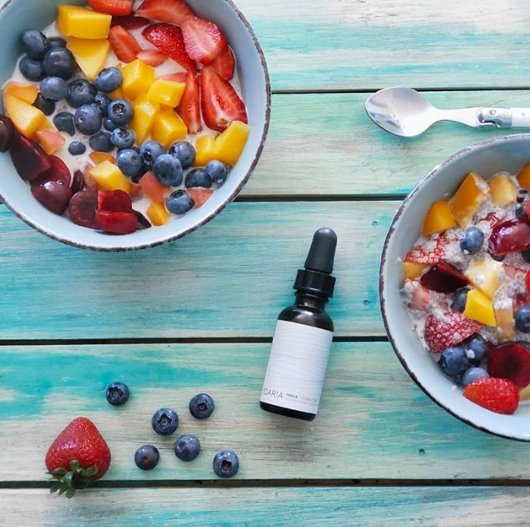 She launched Icaria and has been on a journey to help other women understand the many therapeutic properties behind CBD and how it may help them lead happier, less stressed lives. Even though I do work with the cannabis plant, I consider myself to be in health industry first and foremost. I’ve been working as a nutritionist for 6 years and I’ve always been passionate about living my healthiest life. And even though I have been eating healthy, moving my body and sleeping well for many years now, I always had a major piece missing - I didn’t know how to deal with stress. I felt like I’ve tried everything and nothing was truly working, until I got over my own stigma about cannabis and tried CBD oil. That one experience was so life changing for me that I had to get into the industry to spread the word about the amazing health benefits of this plant. ICARIA’s products are all CBD oils made with CBD crystalline. It was inspired by a modern woman who feels overwhelmed, stressed and anxious by a million things that she has on her plate. ICARIA’s mission is to motivate women to make themselves a priority and take care of themselves. We have recently launched a pet CBD called Loved Pet CBD, since we are Vancouver based and everyone has a fur baby who can use some cannabis. I wake up somewhere between 7am and 8am, make some tea, and follow a terrible morning routine of checking and responding to my e-mails and important social media messages. That usually causes enough of a mental stimulation that I need to take some CBD oil so I am able to enjoy my breakfast after. Not proud of my morning routine, but at least it keeps me passionate about my product since I check it daily. If I am not teaching nutrition at the Institute of Holistic Nutrition, then I am most likely doing all those entrepreneurial tasks that keeps ICARIA running. It’s very important to me to take breaks to move my body and eat healthy meals. I want to continue to inspire women to implement cannabis into their self care routine. And in more practical terms I would love to expand into the U.S. market, which I am working on right now. I also want to create products that are made with other plants and mushrooms to help women deal with stress. In a world where cannabis is fully legalized, first and foremost, all the brilliant minds of the world will be able to conduct, collect and exchange research freely. New research will contribute to the education and further understanding of this wonderfully complex plant. And, obviously, if there is no prohibition in the world, I hope cannabis is widely used for its therapeutic effects everywhere. I tried cannabis for the first and the last time (for the next decade) when I was 18 at a movie theatre watching one of the first 3D cartoons (remember when 3D was a new thing?). I thought it was funny and fun, but I’ve had quite a bit of negative stigma about cannabis and since no one around me ever used, I never used it either until a couple year ago. I obviously have changed my opinion since and that’s why I think most of my clients are actually first time cannabis users - they can relate to my story. I find being an entrepreneur is hard and confusing enough, but add to that, the cannabis industry (in general) and it becomes even harder and more confusing. The industry feels very unpredictable and unclear, for that reason I think we, women in cannabis, are in extra need of community support. Cannabis. I couldn’t run a CBD business without taking CBD - keeps me calm, focused and confident. That it can be stronger therapeutically than pharmaceutical drugs. That ICARIA's products are simple made with plants that have neutral and powerful effects with minimal to no side effects. Personally, I would start using CBD oil years before I actually did - it would have saved me a lot of wrinkles and white hair that appeared due to stress. Sublingual CBD oil is the only way I am currently consuming cannabis. I have tried other forms and they don’t seem to work with my body very well. I am also trying to use more face oils with cannabis as I have seen some results, but I am still in the experimental phases. Concentrate, it is easier to measure. However, it’s a big question, the world is a complicated place. In my opinion, when people have access to plant medicine that improves their quality of life, that is a better world. Call me up! I’d love to help in any way I can.